Many businesses in California frequently find themselves struggling to stay in compliance with current governmental regulations. One of the claims most frequently filed against businesses relates to reclamation liability and remediation, or CERCLA and non-CERCLA closure. As you know, clean-up regarding the removal of hazardous waste, (either short-term or long-term remedial response) can be an extremely expensive proposition. For assistance with your hazardous waste removal problems, contact southern California attorney William B. Hanley. According to United States Center for Disease Control, the Comprehensive Environmental Response, Compensation, and Liability Act (CERCLA) requires the Agency for Toxic Substances and Disease Registry (ATSDR) to compile a list, in order of priority, of substances that are most commonly found at facilities on the National Priorities List (NPL), and which are determined to pose the most significant potential threat to human health due to their known or suspected toxicity and potential for human exposure at these NPL sites. CERCLA also requires this list to be revised periodically to reflect additional information on hazardous substance. The Agency for Toxic Substances and Disease Registry (ATSDR) publishes an online list as well as a series of summaries about hazardous substances known as ToxFAQs. Each fact sheet serves as a quick and easy-to-understand guide. Answers are provided to the most frequently asked questions about exposure to hazardous substances found around hazardous waste sites and the effects of exposure on human health. If your business is faced with possible violations regarding the established prohibitions and requirements concerning closed and abandoned hazardous waste sites, including short-term removal and long-term remedial response actions, contact Bill Hanley for assistance and advice. He can help you anticipate any issues that your business might face. An experienced attorney can help you with issues related to environmental site remediation, environmental liability and compliance, due diligence, and environmental audits. If you’re a California business, the last thing you need is to go to court and face hefty fines for failing to meet environmental regulations. Working with an attorney will take some initial time and effort, but taking this step upfront can protect your business from spending far more time and effort navigating the courtroom in the long-term. Protect your business from audits, evaluate any liabilities you may be held accountable for, and take a proactive approach with environmental laws. 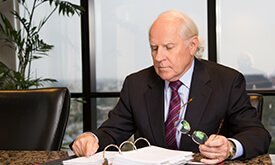 Let Attorney Bill Hanley provide experienced insight regarding the next steps for your business.